During my recent search for the Baikal Teal at Gilbert Water Ranch, I also spent a few minutes looking for the Ruddy Ground-Doves that had been reported recently. They'd been reported to be mixing with the much more common Inca Doves that can almost always be located with a bit of searching. While I didn't find the Ruddy Ground-Doves, I did find a group of those Inca Doves, and as usual, they were quite photogenic. Inca Doves usually congregate in small groups (4 to 15 seems typical, though I have seen a singular Inca in my neighborhood). They are much smaller than other common doves (such as Mourning, Eurasian-collared, and White-winged), and have a 'scaled' pattern as is evident in the photo above. Inca Doves are common in the southern third of the USA west of the Mississippi. While they are easily identifiable compared to the doves I mentioned above, there are two species of Ground-Doves that may present an identification challenge. The Inca's range overlaps with the similar Common Ground-Dove, which can most easily be distinguished from Inca Doves by the dark spots on its scapulars. You may be wondering about the Ruddy Ground-Dove I mentioned above. It is quite similar to the Common Ground-Dove, but is rare in the USA, generally only seen in the desert southwest. 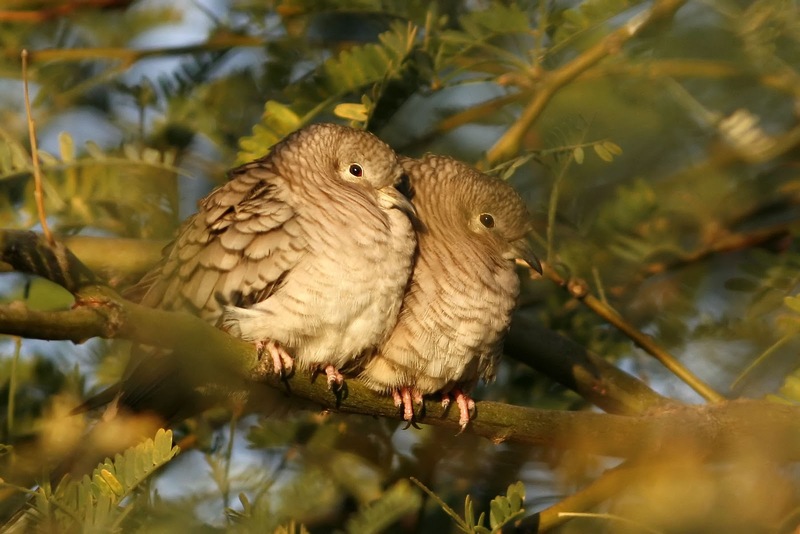 It has an unpatterned breast, distinguishing it from the Common Ground-Dove.